Loud swishes of water and brisk, rasping brush strokes followed until I was encouraged to lower my leg back into the icy water, and raise the other for a similar thorough cleansing treatment. I was grinning, I was in Antarctica surrounded by a breathtaking frozen landscape - and I had penguin poo all over my boots. Expeditions to remote places usually entail a certain amount of hardships so the unexpected luxury of having someone scrub my boots, elevated my view of this vacation. 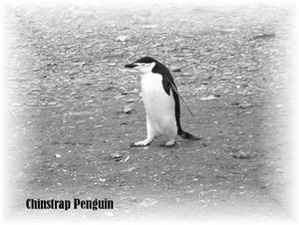 Of course, Orient Lines didn’t want us traipsing muddy, penguin digestive by-products all over our ship, so we recycled, and left it where it belonged - on the White Continent. Long-term vacation planning doesn’t exist in our household, so when the opportunity arose, albeit with only five days notice, I jumped at the chance to fulfill a dream. Hubby was a little harder to convince, but, following the advice of some sage, I found that flogging improved his morale tremendously. We flung together our thermal undies, rampaged through the thrift shops for skiwear and purchased the recommended “wellies” or rubber-soled footwear. Fortunately, bright red parkas were waiting in our cabin when we boarded the ship in Ushuaia, Argentina so we didn’t have to pack outerwear, and they were very, very cozy. Crossing the Drake Passage at Cape Horn instills a modicum of terror in even the hardiest of sailors, would it be a “Lake” or a “Snake”? Armed with motion sickness pills, we prepared ourselves for a day in the cabin moaning and colorless until we reached calmer waters. Not so, the breakfast buffet welcomed us like old friends and it wasn’t until late that summertime evening when we tumbled into bed, that we realized we would have 20 hours of daylight this far south. Attending the enrichment lectures is a large part of these expeditions and the quality and expertise of the lecturers is unsurpassed. Rarely do we have that opportunity to glean first-hand knowledge from well-informed experts and our Ecologist, Mammologist, Geologist and Historian, joined by an Artist and an Ornothologist (the great-nephew of Edward Wilson who accompanied Captain Scott on the ill-fated race to the South Pole), did not disappoint us. Naturally the movie “March of the Penguins” was shown, and although Emperor penguins are rare on the Antarctic Peninsula, preferring the colder interior, in the colonies of Chinstrap and Gentoo penguins abound. These little fellows were waiting to ignore us as, rosy-cheeked from our inflatable Zodiac ride across a berg-studded sea, we grasped the waiting hands that hauled us ashore - through ten inches of chilly water. In accordance with strict rules (only 100 people on shore at one time) we could not go within 15 feet of these flightless birds, but if one came over for a formal introduction we could stand still and make his acquaintance. Many of the chicks, around 5 weeks old, were busy shedding their fluffy down coats and growing their waterproof tuxedo feathers, a process that involves standing still in their guano-encrusted rookery conserving energy for about three weeks. And our army of red-coated visitors, ignoring the “pong” permeating the air, was treading carefully and clicking away in a haze of wonderment, just like a privileged tourist should in nature’s playground. Awesome is not a word to be bandied around lightly in these parts when confronted with vistas of pinnacles, hanging ice cliffs, frozen falls and towering mountains covered in wraiths of cloud. Occasionally, a loud boom or a snap, crackle and pop reverberated in the stillness as a large piece of ice would calve, or break away into the water. 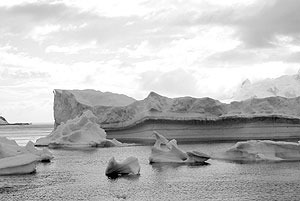 Icebergs take on recognizable shapes, just as clouds do. Ever mindful that we could only see the top eighth of the mass, the dense ice produced an array of colors, mostly a turquoise blue that had berg and bird-watchers mesmerized. “It’s like doing the Rorschach inkblot test,” said one passenger, “see how quickly the smaller ones change their shape and form”. We all agreed that the most spectacular was one that resembled the Sydney Opera House. Standing out on deck one morning, enroute to Elephant Island, I couldn’t help but admire the courage of the explorers of the Heroic Age. Laughingly, we had honored explorer Sir Ernest Shackleton by calling ourselves the Shackle-bak Expedition, but comparing our luxury accommodations to their frigid, wind-swept lifeboats after losing the ice-bound ship Endurance, I felt humbled by their spirit and deprivation. That night, the evening’s usual entertainment was replaced with a sobering reading from Scott’s diary – we were moved by the courage of these men who opened up the continent for us. Icebergs take shape in Antarctica.Those explorers had no idea that tourists would come to Antarctica simply for the pleasure of appreciating spectacular scenery and indigenous wildlife. Most people might like to laze on a Caribbean beach, but judging by our traveling companions and their interests you can tell that this is a hot, hot destination.